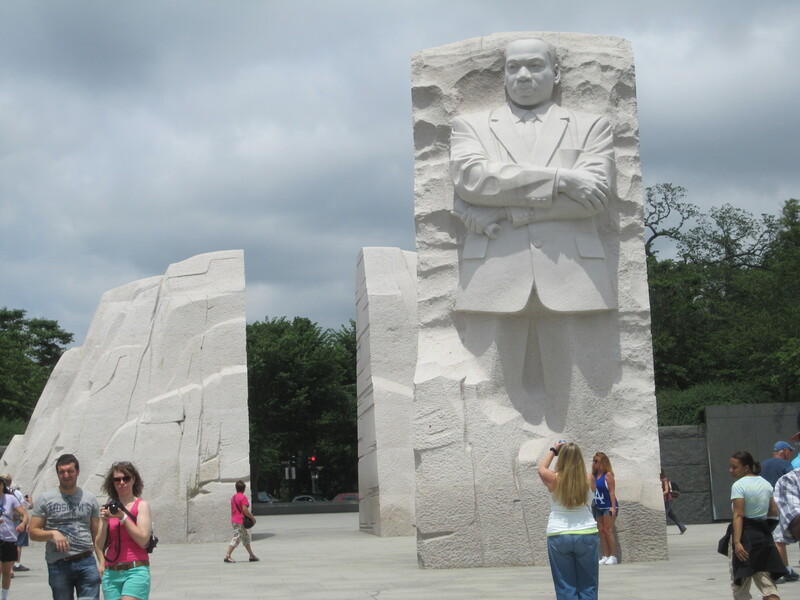 While in Washington, DC, recently I was able to visit two relatively new monuments to individuals who had an extraordinary impact on the 20th Century. As should be the case with all public architecture, the artistry of each memorial was thought-provoking. Artistic choices are made, and those choices impact the meaning of each memorial. If you have seen these monuments I will be interested in your responses to them. The monuments to Martin Luther King Jr. and Franklin Delano Roosevelt are not far from each other. The casual walker can visit both on a stroll along the tidal basin. One implies monumental strength and courage. The other evokes humility and (to my mind) belies the courage and commitment which must have undergirded the life memorialized. The memorial to Martin Luther King Jr. is the one closer to the Mall. King’s image is presented in a larger than life sculpture which looks like it was sliced out of the solid stone ‘mountain’ behind it. 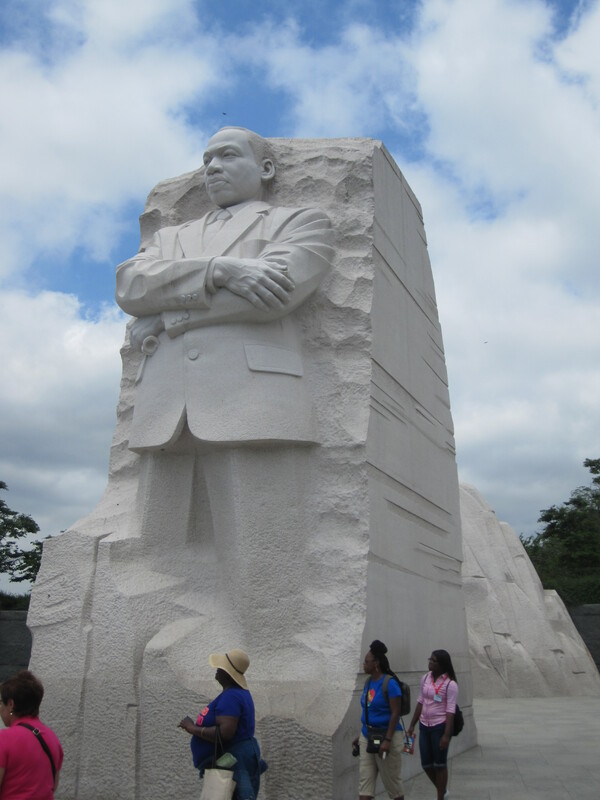 The inscription on the side of the figure is “Out of the mountain of despair a stone of hope” from his “I Have a Dream” speech. This representation reminds me very appropriately of the scripture “The stone the builders rejected has become the cornerstone” (Psalm 118:22). Fourteen other quotes from King’s speeches and writings are inscribed on the ‘mountain’ behind the ‘stone’ where he appears. The overall impression of the man is firm resolve, strength, and a vital legacy. And it is entirely appropriate. A few hundred yards away is the memorial to FDR. We saw the monument at night (a popular activity for visitors to DC) and now realize that we did not see it all. There are several of parts to the monument: two statues of FDR, a bronze soup line, a series of waterfalls implying the controversies and challenges of his four terms of office, and well-known quotes from his speeches and writings. 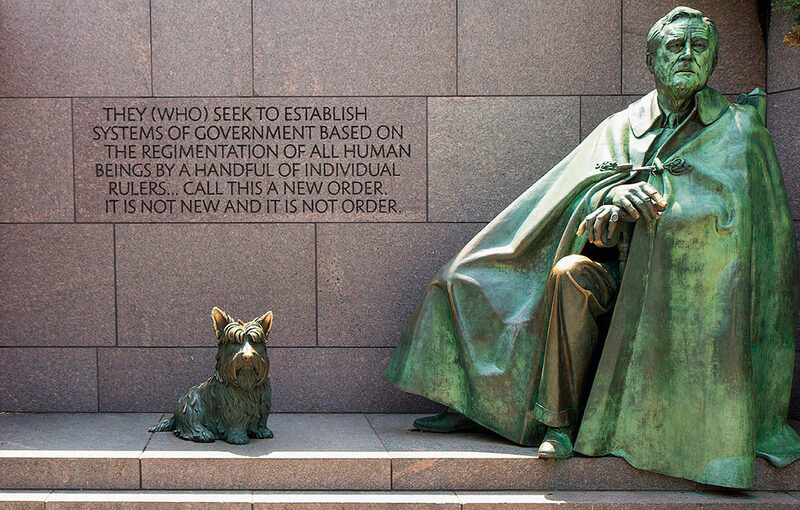 The larger statue of FDR includes his dog Fala but no chair is visible. monument accessible to blind visitors, why are those inscriptions 8 feet above the ground, out of reach for most people?) Should his polio disability be shown clearly? Yes and no. In the larger statue he is seated, covered by a cape which hides his chair. 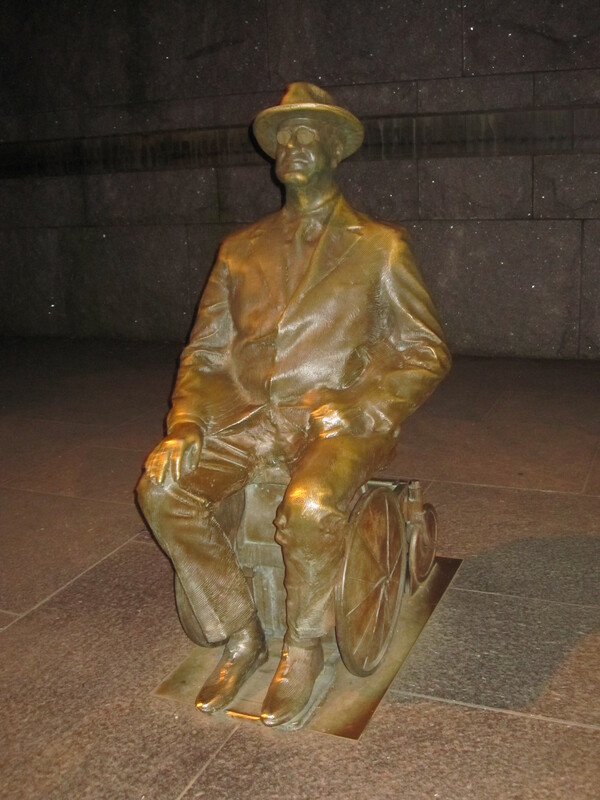 In another statue, a wheeled chair is obvious. But the overall intent to commemorate the man who led the country through some of our most challenging years is carried out well. Designers of monuments know they cannot please everyone – but I found both memorials to be appropriate and evocative. As for my title, “let us now praise famous men” came into my head but I did not know where I got the phrase. Wikipedia says this phrase (originally from the Wisdom of Sirach) was the title of James Agee and Walker Evans’ book about impoverished sharecropper families during the Great Depression. Naming people who are at the bottom of the society as Famous Men creates a special poignancy for the phrase, and implicitly questions our designation of what makes a person Famous – or Great. How many other Great Ones have there been? And where are their memorials? Think about it, and adjust attitudes as required. This entry was posted in Travel, Uncategorized and tagged FDR, Franklin Roosevelt, Martin Luther King Jr, memorials, monuments, travel, Washington DC. Bookmark the permalink.